I thought I’d try and get on the ball this year and release a year-calendar (Jahreskalendar for our German fans) template before the new year actually began. And it is a good thing I did too, since the download actually shows FOURTEEN months. The extra two are for December 2018 and January 2020. 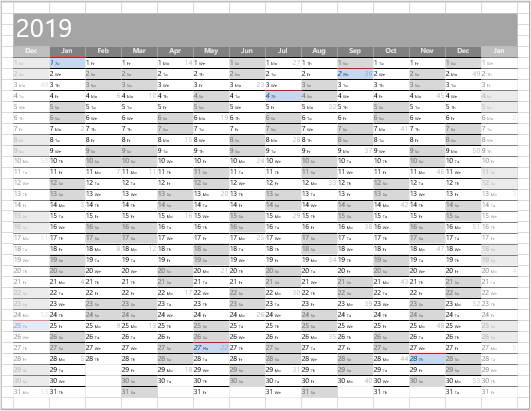 Week-numbers (Kalendarwochen) built right in, so you can see which week you’re at, at a glance. Customizable holiday list, so you don’t have to live with the ones I’ve given you. Customizable day names, e.g. in the language you speak. Customizable month names, e.g. in the language you speak. 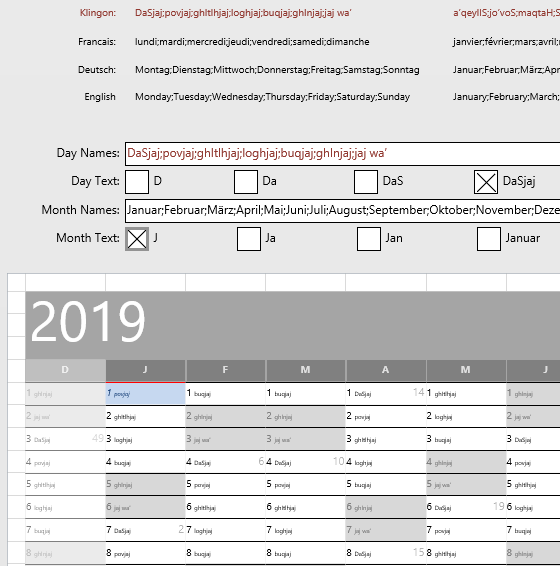 Custom page-grid that matches day sizes, so it is easy to resize Note and Block shapes to fit precisely over dates and ranges of dates. Just flip to the page you want, and print it! Just be sure to check Print Current Page when you do send it down the wire, and be sure you’ve got selected page matching the paper size of the target printer! So let’s not over-think this. The following content is your Help Manual for using the 2019 year-calendar, but there’s no needless over organization. Browse. Peruse. Read a bit. Look a bit. First off, it’s a calendar. The WHOLE year, plus “last December” and “next January”. The non-year months are faded out a bit to add clarity. Each month is a vertical column. You can format Saturdays, Sundays and holidays differently. If you have a large-format printer, then you can make a gigantic one to fit on the wall. If the page size you want isn’t already built, no worries. The drawings are responsive. Just right-click on any of the page tabs, and choose Format Page. You can pick a new page size/ printer-paper size, and the shapes should all dynamically re-fit to your page size and margin choices. 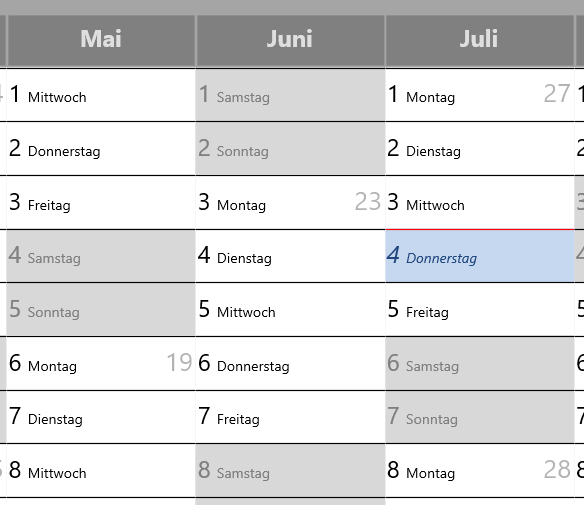 I am aware that your German friends really like knowing which week-of-the-year it is. I had never heard of this before I moved to Germany. But some folks have mentioned that U.S. folks working in manufacturing use this as well. Maybe only when they talk to the Germans? You can enter holidays in the holiday box. 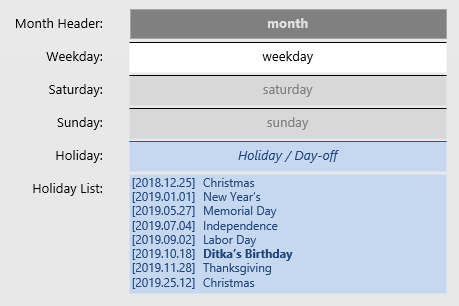 Below, I’ve just edited the list to include the birthday of Mike Ditka, famed former coach of the Chicago Bears, as a custom holiday. The date must be enclosed in square brackets. This helps to prevents incorrect text-finds in the ShapeSheet logic. The date must be in “descending importance” format, so YEAR/MONTH/DAY. This prevents incorrect “finds”, and simplifies some regional-settings issues that occurred in the behind-the-scenes ShapeSheet logic. You can separate date parts with a “.” or a “/”, but you don’t have to. The text that comes after the date is meaningless from a calendar-functioning standpoint, but it’s nice for humans to read. The text won’t show up in the date blocks, unfortunately. Above the drawing, also in the off-page pasteboard area, you’ll find controls for the display of text. You can enter lists of Day Names and Month Names. Just type in semi-colon-separated lists into the field-shapes. I’ve included pre-built lists in English, French, German…and…Klingon, so you can just cut and paste if one of those is your thing. You can then specify what sort of abbreviations to use, using the check box controls. 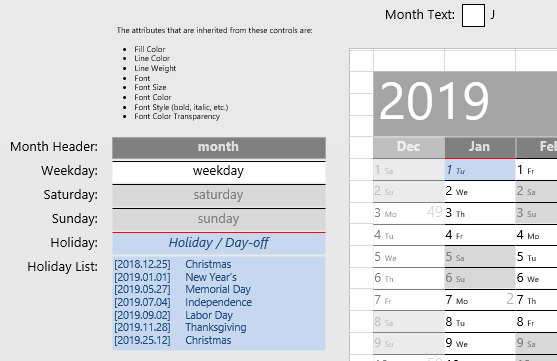 These control how much of the month name to show in the column headers, and how much of the day name to display in each date block. Just double-click or right-click a check box to check it. 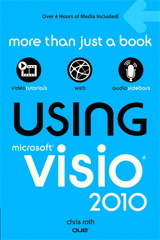 Remember, these are just Visio rectangles, with a bit of smart behavior behind them. They’re not really Windows Forms controls–hence the need for double-clicking or right-clicking to get them two work. 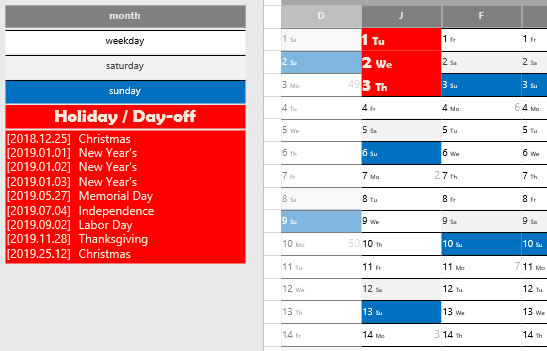 They are configured so that by default, they match the calendar’s grid. So, for example, when you drop the 5-day Block onto a page, it will be one day wide by exactly five days high. Since the page has a custom grid, resizing these shapes should be a…snap. That is, the size of a shape will easily snap to match the grid of the calendar. I’ve also added these three shapes in the left-margin of each pre-built page, in case you don’t feel like hunting for the Document Stencil, which may not be visible by default. Here, I”ve added some block shapes and a day note to the October column. Changing the color is simple enough, but you’ll need the Format panel (press F3) to adjust the transparency. I switched from the default red to a darker orange, and turned down the transparency a bit more so that the white text was more readable. That’s about it for Year Calendar 2019. Happy planning and scheduling! Are you a Chicago Guy? 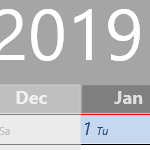 Thought I’d let you know the Christmas holiday date format has the month and day reversed so it doesn’t display in the calendar as downloaded. @Phil – no, not a Chicago guy, but for some reason, those old Saturday Night Live skits popped into my head when trying to come up with examples. @Richard, Thanks for the heads-up and the sharp eyes! I’ve fixed the download.